A marque quote for papal apologetics (a topic which I have already addressed) this week’s gospel also poses the question, “Who do you say I am?”: a question frequently answered though not always asked. I personally find this question challenging. Who do I say Jesus is? I know the right answers – Lord, Messiah, the Christ, Rabbi, Saviour, teacher, master, friend, and many more. But who do I say he his? Jesus calls me to a deeper and more personal relationship. He is all these things and he can be all things for all men all the time. But for each of us at different times our relationship with him will have a different slant. By this I mean that as we grow our perception of things will change and in this way Jesus will be different things to us at different times. Having thought about this deeper than I had in many years I still am unsure. I do not say this out of a wilful ignorance nor of a lack of personal relationship (for that though there is still plenty of room). But nonetheless, I was no closer to finding who I say Jesus is for me at this time. Given that Jesus is the head of the Church, which is his body, I looked at the way I most profoundly experience Jesus in the context of the church. Surprisingly I most profoundly experience Jesus in the sacrament of Reconciliation. I say “surprisingly” because I have a love for the Eucharist. Yet there have been moments in my life where I have gone to confession in tears (quite literally) and walked out on an emotional high. This has shown me that I experience Jesus most as merciful Redeemer. Even with this self awakening, it is not to the level of Peter’s proclamation “You are the Christ, the Son of the Living God.” But I don’t think it has to be. To Peter he is one thing, to me another: neither of these are wrong nor contradictory. Who is he to you? It really is a challenging question, but with the answer comes clarity. So again, who is he to you? Is this cheating? Putting a few reflections in one? Some might say so but I’ll do it anyway! I’ve been busy. Have you had some busyness in your life? I’m sure you can relate. You may have been more busy I. You may have been less. But there comes a time nonetheless where the ordinary life becomes a memory and the mundane a dream. I wont go into with what my days have been consumed, suffice to say they unfortunately have somewhat limited my alone time with God. I find this sort of advise more of a shifting of focus more than anything else. Not quite as practical as I would hope. And I’m afraid I cannot help beyond that. I found that if I shave some time off in the mornings, getting up a little earlier, say, or likewise in the evening, then I only rob Peter to pay Paul. It feels as if it is not enough. I find it is easy to get disheartened, feel inadequate and give up for a bit. In the last few weeks Jesus has reminded me how much we can get from just a little. It was only five loaves and two fish that feed five thousand: it was the first step that got Peter walking on the water: it is the crumbs from the feast for the people of Israel that heals the daughter of the woman of Gennesaret. It takes courage and obedience to take that first step. The familiar cycle of willingness, courage, success, trial, then failure is one that is shared by many. Through these last few busy weeks I am reminded to keep my eyes on Jesus. Peter called to be saved by keeping his eyes on Jesus, the crowd was fed through the obedience of the apostles, and the woman saved her daughter through an at of courage. With each cycle we become a little more courageous and a little more obedient, if we only keep our eyes on Jesus. I know that even the little time I give – as inadequate as I feel it might be – is enough for Jesus to do his work in me. Jesus, I am sure, is not only after quantity of time. A minutes prayer said with sincerity is worth a thousand years of hollow devotion. While time is worthwhile he wants our hearts, if only we are courageous enough to give it. I am a big supporter of intentional living as opposed to just cruising on by. Intentionally getting up early to dedicate time for God, for exercise, for gathering thoughts for the day. But this is a struggle. Some days, like the wet windy winter days I am in now, make the doona more attractive than the floor. I find myself bargaining, or rationalizing, or excusing, or shaving time from this end and that. There are all sorts of reasons for me not to do anything, if I wanted to find reasons. Sometimes I do. Sometimes I convince myself that these reasons are valid. But one primary reason for me to do these morning activities is so that I can be at my best longer through the day. I can more fully give of myself if I am in the best condition. I, a server, can serve for longer if I am able to do so. And those that I serve (think family) are more appreciative of my giving a better self, as opposed to the self that was worn out at the end of a working day, the self that is the remains – the scraps – of the best self which had been given to seemingly more important endeavours. Turning to the gospel we find Jesus and his disciples afloat searching for a lonely place. Why? I mean, they often spent time alone. But why in this occasion? It was upon hearing the news of the death of John the Baptist when the need of isolation and comfort wells to the surface within him. Being fully human he would surely have experienced the deep sorrow accompanying the loss of a loved one, a family member, a teacher and mentor; a sorrow shared with the disciples especially the ones who were once disciples of John the Baptist. Yet among this sorrow Jesus ignores his own need and takes pity on the pressing crowd. The disciples seem to humour him and come along until, perhaps having enough of entertaining others, they seek their own comfort. Dismissively the carnal excuse they give is food. It is when the crowd is gone that the disciples could return to mourning the death of John the Baptist. And presumptively so could Jesus. Resolute Jesus continues to address the needs of the crowd: initially spiritually, but now also carnally, negating the dismissive excuse of the disciples. 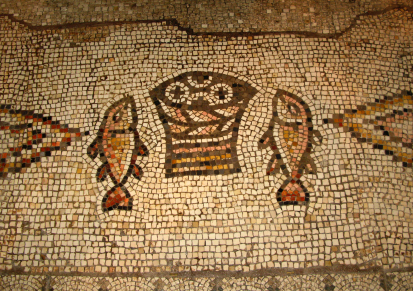 Having in mind not only the needs of the crowd but also those of his disciples Jesus performs the renowned miracle of the multiplication of the loaves and fishes. Following the formula we will see at the institution of the Eucharist Jesus gives the multiplied bread and fish to the disciples to give to the crowd. They have become more involved in the community, and with Jesus, when they sought to separate from them. Responding to those natural and very human emotions of sorrow and sadness need not limit us from the work we do in service to others. One way to ease the pain is to both acknowledge the hurt and the loss but continue the daily grind whatever that routine may look like. With the numerous accounts of the multiplication of the loaves and fished in the gospels it would be safe to assume that this miracle is one performed on a number of occasions even perhaps a semi-regular occurrence. This then shows that the crowd and the miracle have some sort of ordinariness (if one can possibly use this word to describe the life of Jesus). He addresses the need of the disciples and the need of the crowd in one simple but divine action. And he was with them every step. We can find reasons why we do not wish to serve and some of these might be valid. But to the capacity that we are able we are to allow Jesus to nourish us, guide us, renew us and lead us through pain, sorrow, sadness and hurt to become better servants of his people. More is expected of us as his servants and we can do that when we give him room intentionally to work in us, to give of ourselves in a hungry world.